If you have many moveable objects you want to perform the same operation on, you can group the items into an ItemGroup. 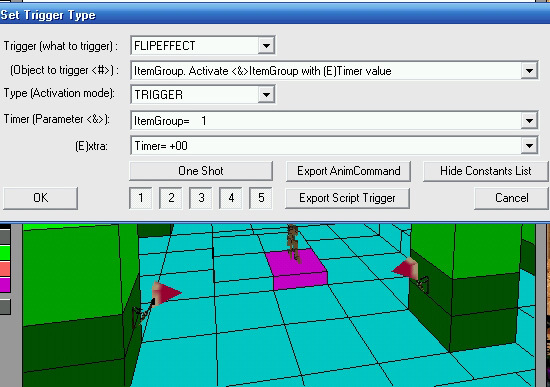 You then only need to create a single ItemGroup FLIPEFFECT trigger to have that operation performed on all of those objects at the same time. Some of the operations you can perform on an ItemGroup are shown below. 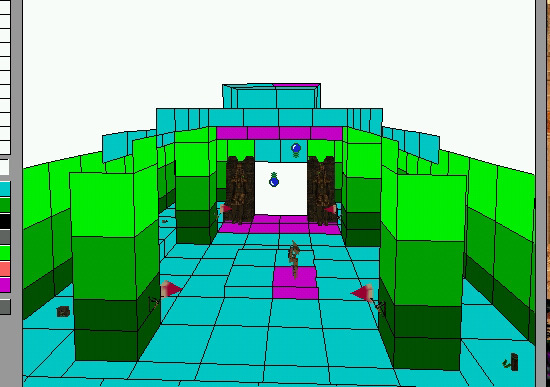 In tut1.prj we can group the four FLAME_EMITTER2s in this room into an ItemGroup since they are moveable objects. There are four triggers placed under Lara to activate the FLAME_EMITTER2s. 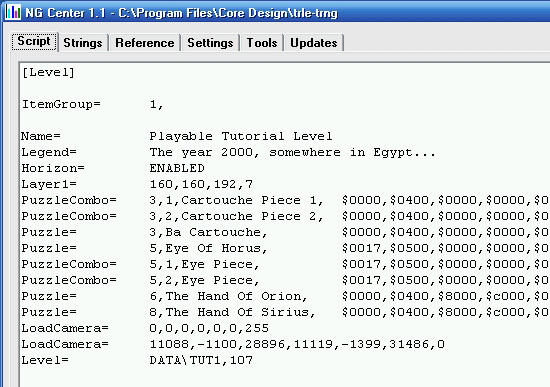 In the [Level] section of the script in NGCenter type ItemGroup= and then a number followed by a comma, ",". You must use a different number for each ItemGroup= command in the same [Level] section. Now type the index numbers for the objects you want to include in the ItemGroup. Each index number must be separated by a comma, ",". The index number is the number in brackets that appears in the yellow box near the object in NGLE when you select the object by left clicking. You can have up to 83 objects in a single ItemGroup. In NGLE the index numbers for the FLAME_EMITTER2s are 211,209,144 and 216. The complete ItemGroup is shown below. Build the script and check for errors. 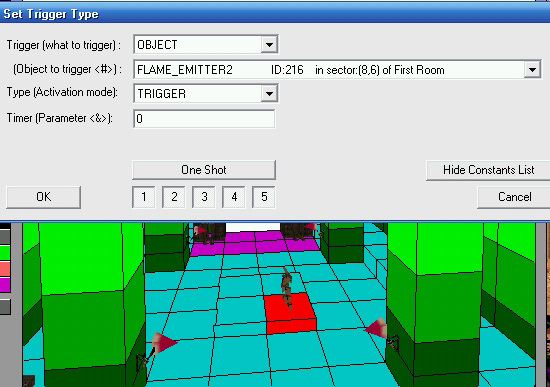 In NGLE the four triggers to activate each FLAME_EMITTER2 can be deleted and replaced with one FLIPEFFECT trigger. Paolone uses an ItemGroup in his Miscellaneous sample project to move a group of spikes up and down together.